Ahh…percents. That OTHER topic that is related to fractions that causes so much grief! Well, put that grief aside because I guarantee you 100% that you will soon be able to understand how to 'do' percents! One of the most common types of percent problems is the 'out of' types of problems. Read each of the following. 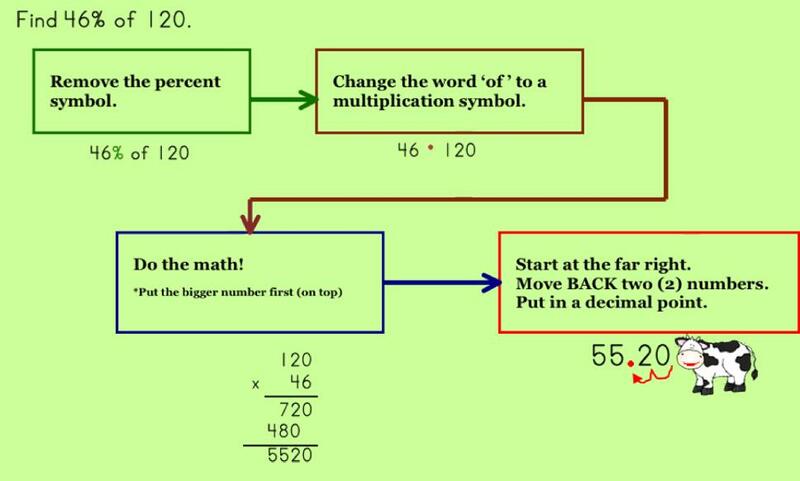 Are you struggling with these types of percent problems? If you answered, YES! then go to the 'Out of' Percents page for help. Are you stumped yet? Are you thinking, "I need my calculator!" and, then realize, "I don't know what buttons to push!" Don't fret, these are actually really simple IF you remember to moooooo.